John focuses on retirement planning, portfolio analysis and design, investment management programs, business owner planning (including employer-sponsored retirement plans), and charitable giving strategies. He is a CERTIFIED FINANCIAL PLANNER™, a Chartered Financial Consultant, an Accredited Investment Fiduciary and a Chartered Retirement Plans Specialist. John is licensed as a registered representative of Sigma Financial Corporation in Ohio, Michigan, Indiana, Florida and Arizona. He is also licensed as an investment advisor representative of Sigma Planning Corporation in Ohio, Michigan, Indiana, Florida, Alaska, Arizona, Colorado, North Carolina, New York, Tennessee, Illinois, and Virginia. 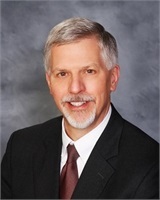 He is a member of the Financial Planning Association (FPA), and past board member of the FPA of Northwest Ohio. John has been a guest speaker and instructor on financial planning and investments topics for The Ohio State University Extension and Northwest State Community College. He currently serves as a board member of the Liberty Center/Liberty Township Joint Economic Development District. Prior to beginning his financial planning career in 2001, John was an information technology manager and consultant for more than 15 years. He holds a Bachelor of Science degree in Business Administration from Heidelberg College in Tiffin, Ohio.